There are two ways to check if you're using VDL library version 2.5.5. Via the "Info" Pulldown – Click the library "Info" button and select "Library Version" which will call forth a window that gives you the information. Via the Instrument Options Window – In Kontakt Player, load one of your VDL instruments, then click the “Gear” icon which brings up the “Instrument Options” window. In the “Infos” area, you should see your library listed as version 2.5.5. Library 2.5.2 requires you to check the library version by checking the instrument list in Kontakt Player (see screenshot). 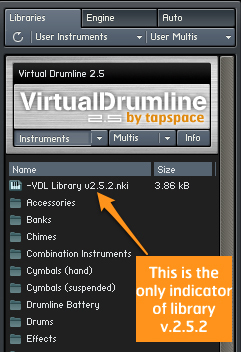 If you're using VDL library 2.5.2, you'll see a "VDL Library v2.5.2.nki" file alongside your other VDL instrument categories. This is the only indicator of library 2.5.2, and you should ignore the information you see in the Library Info (Kontakt 2) or Instrument Options/Infos (Kontakt 4+) windows, which will likely show 2.5.1, even though you're successfully using 2.5.2. Library 2.5.1 comes with its own installer made by Native Instruments which will update your Kontakt Player to v.2.2.4, as well as installing the 2.5.1 library. Once you've run the installer, you'll see library version 2.5.1 listed in the "Library Info" window of Kontakt Player 2. Library 2.5 was the original version of VDL 2.5 that came on the Virtual Drumline 2.5 DVD. This will show library version 2.5 listed in the "Library Info" window of Kontakt Player 2. It is highly recommended that you update to library version 2.5.5 (available from Tapspace webstore) and Kontakt 5 (free from Native Instruments).